additional $100 each. All Bait, Tackle and Fishing Licenses are provided and included. Ask about our “Loyalty Discount Program” For returning customers. Please see my “Rates” page for additional information. The “Go Fish” is a 25′ Carolina Skiff 258 DLV center console powered by a 200 H.P. Yamaha Four Stroke outboard motor. She has a 8′ beam with a 6″ draft,is rated to carry 18 passengers so can easily accommodate 6 anglers. U.S. Coast Guard Licensed; and Insured. Go Fish Inshore Charters is your primary source for private Myrtle Beach Fishing Charters and North Myrtle Beach Fishing Charters. I cater to anglers of all ages and skill levels and will customize your trips to fit your needs; whether you are an experienced angler with many years of accurately casting your bait into the exact spot where you want it to be, or the novice angler who has never used a spinning reel before. I am there to help each person that needs instruction on how to cast their line to where the fish may be and how to fight and reel in their fish with the light tackle that they will be using. I enjoy taking families with kids. My wife and I have been blessed with two great kids. The top left photo is of my son, Tyler holding two Speckled Trout when he was 10 years old; the photo below it is of Tyler this past October holding a Redfish, he is now 23. My daughter isn’t into fishing much, she just likes boating. My point being that, as a parent, I am very familiar with what it takes to make sure that children have an enjoyable time. The youngest child that I have taken on a fishing charter was 4 years old and I would suggest that as a minimum age limit. In my experience, children 7 years and up are the ones who truly appreciate spending 4 hours on a boat. These are private fishing charters by reservation only. I will be the only other person on the boat in addition to the person who made the reservation and the people that they bring with them. I do not put parties together; so if you are a single angler looking to share the cost of the trip, you will need to encourage your friends to accompany you. 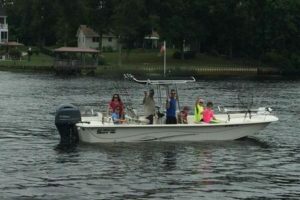 If you are planning to go fishing in Myrtle Beach or fishing in North Myrtle Beach and would like to be on a fun private fishing charter, then you are in the right place. If you like to fish from a boat but don’t like to get seasick you are also in the right place. We fish primarily in the calm waters of the Intracoastal Waterway, Salt Marshes and Little River Inlet. We do sometimes fish the near-shore reefs three miles out, but only at the client’s request and only if the sea swells are two feet or less. Our typical North Myrtle Beach fishing charters start at Anchor Marina in North Myrtle Beach; we head North along the Intracoastal Waterway through North Myrtle Beach and Little River, maybe stopping along the way to try some fishing holes until we reach near to the SC/NC border; then depending on where we have been having the most success on previous trips, we may go fishing further into North Carolina along the Intracoastal Waterway or we may stay in South Carolina and fish the salt marshes between the waterway and the Little River Inlet; in addition to fishing the inlet itself. Most of my fishing charters will encompass both South and North Carolina; but not to worry we have blanket licenses that cover everyone fishing from the Go Fish in both states. Most of the year we use spinning tackle with 20 pound test braided line and live bait (shrimp, mullet minnows, menhaden) that I will catch in my cast net. In the cooler months when there are not any schools of bait that I can throw my net on, I will buy mud-minnows from one of the local bait shops. Sometimes we will also use fresh cut shrimp, which is a favorite meal of Black Drum. We will use lures sometimes in the winter while fishing for Speckled Trout; usually Berkley Gulp Shrimp. The 20 pound test braided line is as thin as 6 pound monofilament and better able to handle the big Bull Redfish that come in from out of the deep ocean to spawn at the Little River Inlet from September until November. It can also hold up better against the many oyster shells that are prevalent in most of the areas that we will fish. Please do not bring spray or aerosol type sunscreen for use on the boat as it goes everywhere and gets on everything including the deck, resulting in slippery and unsafe areas to walk on. You may spray it on in the parking lot of the marina before we board the boat, but please only bring rub on type sunscreen for use on the boat.